2012 Mom's Choice Silver Award-winner! 2011 League of Utah Writers Silver Quill Winner! 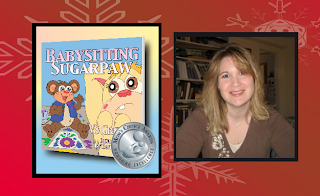 A little bear named SugarPaw hopes to get rid of his babysitter, bonnie Whiskers, by getting her into trouble after making changes to his rules chart. As the story unfolds, SugarPaw learns about honesty and friendship. Babysitting SugarPaw, with its child-centered plot on gettng to know others, is the perfect book for littel ones scared of being left alone with a babysitter for the first time. This book will delight three-to-eight-year-old-readers, especially those who like to create mischief. VS Grenier is an award-winning children's author, founder & owner of Stories for Children Publishing, LLC, award-winning editor-in-chief of Stories for Children Magazine and chief editor for Halo Publishing, Int, and also, the host of the blog talk radio shows on The World of Ink Network: Stories for Children, The Writing Mama, What is Success and Families Matter. A California girl at heart and former fashion buyer, Grenier lives in Southern Utah with her supportive husband, their three children and the family's miniature schnauzer Taz.